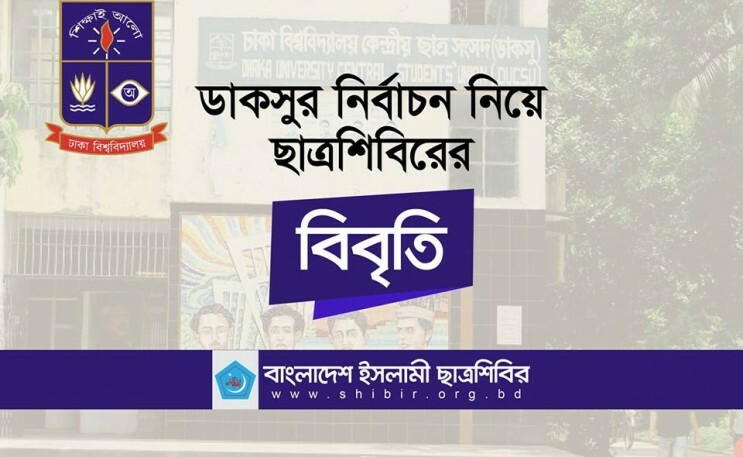 Bangladesh Islami Chhatra Shibir has issued a statement condemning the attempt to derail Dhaka University Central Student Parliament (DUCSU) elections through vote theft, attacks and vote irregularities on the night before the election. In a joint statement, Chhatra Shibir Central President, Mubarak Hossain, Secretary General Sirajul Islam, and Dhaka University President Mohammad Sharfuddin and Secretary Ahsan Abdullah said that the midnight voting like the national election was repeated in DUCSU election. In the national election, the illegal government snatched away the right to vote of the people. Likewise the voting rights of the student community in the DUCSU elections was also snatched. Despite objections from student organizations, the voting was initiated the ambiguous ballot boxes. After the voting began, students from the Bangladesh-Kuwait Moitri and Rokeya Hall uncovered sacks of ballot papers with seals and sealed ballot boxes. Voting was also closed at Kobi Sufia Kamal Hall on charges of irregularities. Such irregularities more or less persisted in all halls. Press restrictions were imposed on the media personnel to enter the voting center so that they would be prevented from reporting on the real events in the voting. Many candidates were even not allowed to enter in the halls. On the other hand, BCL activists and their outsider supporters roamed freely in the halls. Entry to the guest rooms and hall rooms in control of the Chhatra League was forbidden to students. Those who voted by the Chhatra League's order were then made to stand again in the line of voters and made to lose 10-15 minutes for each vote in the same order. Non-resident students were barred from voting. The candidates and students did not get any desired solution even after complaining to the administration about these issues. In contrast, however, many VP candidates including others were attacked by the Chhatra League. Students organizations boycotted the election for vote rigging and irregularities with the complete support of the university authorities. This is a big shame for the whole nation. In order to grant victory to BCL in an unethical way, the government and policy-makers of the university have defiled the memory of a glorious and important election like DUCSU elections. We do not possess the language of condemning this shameful incident. The leadership said that DUCSU elections were being held after 28 years. So the students were eagerly awaiting the use of their vote franchise. But, like in other elections, there has been shameless fraud. DUCSU's golden past has been tarnished The right to express the opinion of the student community has been taken away, which will not be accepted by the student community in any way.